Download this free cheerleading paper. Cheerleading-themed scrapbook paper lends a spirited atmosphere to your memory book pages. Try one of these exclusive free downloads to give you inspiration for your next cheerleading layout. Free printable papers are an affordable way to scrapbook your favorite cheerleading memories. These designs are suitable for scrapbooking photos and memories from cheer camp, cheerleading practice, the big game itself, or after-game parties. To use your paper, simply click on the image of the design you like. Save the file to your computer in a location that's easy for you to find, then open the PDF file using Adobe Reader. Print it onto sturdy white paper using your inkjet printer. Download this cheerleading paper design. 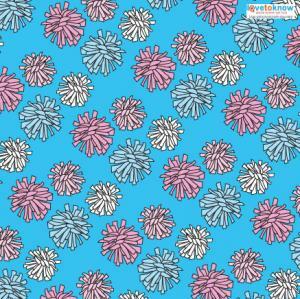 Download this pom pom paper design. Scrap Your Trip offers a page full of cheerleading scrapbook supplies, including some customized 12x12 inch scrapbook paper selections. Try this custom cheerleader top design that lets you choose your colors and team name to create a paper that looks like the top of your cheer uniform, and custom cheerleader skirt that you can create to match. These papers cost about $4 per sheet. Another great source for cheerleading scrapbooking supplies is Scrappin' Sports Stuff. You can sort by theme, so it's easy to find what you're looking for. The cheerleading section has several papers including Cheer Squad Collage with several sayings and a Go Team paper which features uniforms, megaphones and two phrases. The back side has a coordinating turquoise leopard-print. Scrapbook.com's section of cheerleading scrapbook supplies includes items from Reminisce, Buckle Boutique, EK Success, We R Memory Keepers, and more. Their double sided chalkboard paper offers a neutral backdrop that's perfect for all your favorite cheerleading photos, and it retails for about a dollar per sheet. If you're a digital scrapbooker, Cheer on by WendyP Designs includes everything you need to create amazing pages. There are 18 patterned papers, nine solid papers, and dozens of interesting elements like megaphones, words, an alphabet, numbers, basketball and football items, and more. This kit includes .jpg and PNG files and sells for about $8. 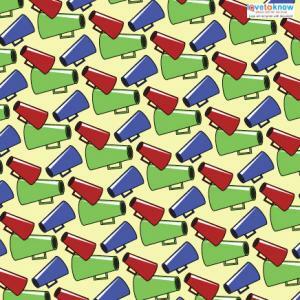 We Got Spirit from Sweet Shoppe Designs is a brightly colored cheerleading kit that includes nine patterned papers and three solid designs, in addition to 55 themed embellishments such as a megaphone, pom poms, spirit stick, and glitter stars. This set costs about $4. Regardless of the papers you choose, cheerleading layouts can be great fun to create. Don't be afraid to use unusual techniques, such as creating a human pyramid with cropped head shots of each team member mounted to your background paper. Adding pop ups to jumping images of your cheerleaders to make them appear as though they're ready to pop right off the page is another clever way to add impact to your page. The possibilities are limited only by your imagination.